Your complete tactical guide to defending with the 4-3-3 has arrived! Dutch 4-3-3 Team Defending features a complete coaching seminar focused on the roles and responsibilities of the 4-3-3 formation. Discover how to make play predictable and how to control where the ball is played to stifle attacks and keep the ball out of your half. Does your team lack organization in defense? Do your players charge into tackles and leave big gaps for the opposition to exploit? The key to building a strong defense when playing the 4-3-3 formation is ensuring your players have a system to adhere to and a predictable style of play. Now you can discover how to develop it in this special video series. Dutch 4-3-3 Team Defending features a complete coaching seminar on how to develop a rock solid defense. 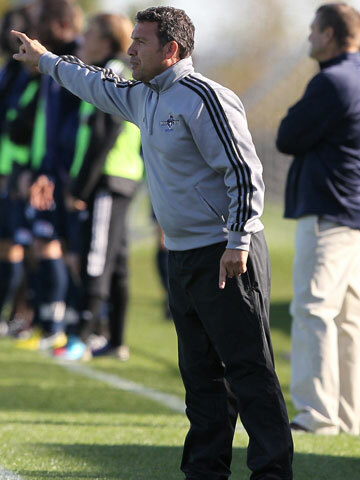 The seminar is presented by multiple NSCAA Coach of the Year Marco Koolman who covers all the key fundamentals of playing in defense in the 4-3-3 formation. This includes the roles and responsibilities of every player, how to overcome the formation’s Achilles heel on the sides of the midfield, how to prevent the opposition from playing the long ball and how to force the ball where you want it to go. Watching Dutch 4-3-3 Team Defending will enrich your understanding of the formation’s strengths and weaknesses in defense. More importantly, it provides you with a blueprint for developing a predictable style of players so your team knows exactly where to apply pressure and how to force opposition attackers into vulnerable positions. After applying its principles on the training pitch, on game day your team will be able to break down opposition attacks more frequently and dominate play all over the pitch. First developed in Holland in the 1970s, the 4-3-3 was developed to counter England’s 4-4-2 formation. As such, it is specially designed for stifling long balls and to direct opposition players into areas where they can be pressed and forced to make a mistake. To harness the defensive capabilities of the 4-3-3, and make defending more predictable, your players need to know when and where to apply pressure. Developing this understanding will ensure they make the right decisions and are better prepared on game day. Dutch 4-3-3 Team Defending covers everything you need to know on how to use pressure to prevent long balls, how to divert the ball into the channels, how to condense space in midfield and gain the advantage of numbers. Instead of drills and exercise, you get a complete tactical overview on harnessing the 4-3-3’s strengths and overcoming its weaknesses. The video series features a complete coaching seminar on how to make your defensive play predictable so you can block opposition attacks and force their players into vulnerable positions. 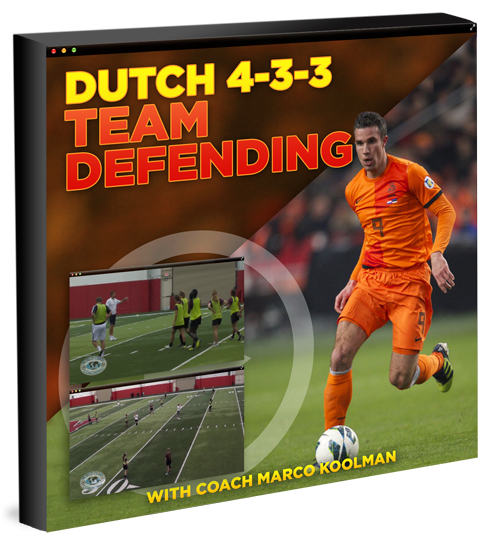 Rather than a series of drills and training exercises, Dutch coach Marco Koolman provides an in-depth presentation on the core principles and best practices of defending with the 4-3-3 formation. The session begins with Koolman explaining how the 4-3-3 needs to be setup against a 4-4-2. Success lies in blocking the opposition from playing long balls, and Koolman explains how to do this by forcing them to play the ball into the channels. He also runs through the roles and responsibilities of players in preventing the opposition them from building from the back. The session then looks at how to force the ball inside by keeping pressure on the opposition fullbacks. This is achieved through getting your players into positions that deny them the time and space to play a long ball or passes across the pitch. Koolman explains how you can then gain an advantage with your fullbacks and to shut off their passing options. With the fullbacks advancing, Koolman explains the responsibilities of the center backs to defend the space left behind and be ready to deal with passes to center forwards. The ball is likely to be played through the middle, and Koolman highlights how to stifle this harnessing the predictability of his defensive system. The focus now shifts to the midfield and how to force the ball into the middle. The 4-3-3 is inherently stronger in the middle, so forcing the ball into this area will give you the added numbers to force a mistake and win the ball. Koolman also explains what to do once the ball has been won so the shape isn’t disrupted and players stay in position. Koolman now looks at how to turn the midfield triangle around so you have two holding midfielders and one attacking to create a 4-2-4. He then ends the session explaining how to train players to understand their role in condensing space, keeping shape while other players press and forcing the ball to go where you want. Ensuring your players are familiar with the 4-3-3 system will help them to make better decisions and be better prepared on game day. To build this familiarity they need to understand what their roles and responsibilities are when pressing and forcing opposition players into specific positions. Dutch 4-3-3 Team Defending provides a complete coaching seminar on how to develop this understanding, along with all the core principles of defending effectively in the 4-3-3. Defending in the 4-3-3 demands a high work rate and coordination. It also requires players to make the right decisions at the right time. Otherwise gaps can be created for the opposition to exploit if players charge in without covering support from teammates. In this coaching session, Marco Koolman explains exactly what players need to do in order to make defending more predictable so you can control where the opposition goes. Whether you coach elite teams or recreational sides, players at every level can benefit from the insights covered in the video series, which will improve their awareness and decision making on game day. WORLD CLASS COACHING is recognized globally for the quality of its soccer coaching resources, which are used by over 40,000 soccer coaches from around the world. We wouldn’t be offering Dutch 4-3-3 Team Defending unless it achieves our exceptionally high standards. However, if you are not 100% satisfied with the quality of Dutch 4-3-3 Team Defending after six months of implementing its small sided games and exercises then please contact us for a no quibbles refund. The key to defending with the 4-3-3 is ensuring your players know when to apply pressure and how to support each other to cover space when they do. Developing this mindset requires an understanding of how the entire team works as a defensive unit in the 4-3-3. Drills and exercises alone cannot develop this understanding. Instead, you need a complete system you can teach on the training pitch that will make them better mentally prepared on game day. Dutch 4-3-3 Team Defending provides you with this blueprint. 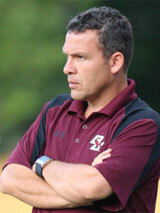 Dutch coach Marco Koolman runs through a complete strategy for creating a predictable and effective team defense. In the video series he covers the roles and responsibilities of players, where and when to apply pressure, how to force the ball into the center where you have superior numbers and how to ensure your team keeps its shape and discipline. Defending in the 4-3-3 demands a high work rate and coordination. Your players need to know not only their own responsibilities but also those of their team mates to ensure pressure can be applied at the right time without creating gaps. Dutch 4-3-3 Team Defending explains how to develop this understanding so you can force the opposition to go where you want, to force mistakes and direct the game in your favor. P.S. Dutch 4-3-3 Team Defending is a video series which features a complete coaching seminar on how to build predictability in defense so you can control where the opposition plays the ball and force mistakes. Rather than drills and exercises, you get a complete tactical blueprint for turning your team into a disciplined, intelligent and rock solid defensive unit. P.P.S If you are not 100% satisfied with the quality of the soccer coaching resources in Dutch 4-3-3 Team Defending within six months then we will refund your purchase in full, no questions asked.